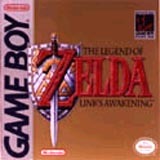 The fourth game in the series, The Legend of Zelda: Link's Awakening brought Hyrule's greatest hero to the Game Boy for a portable adventure that not only emulated the series' elements, but expanded upon them. In addition to actually being somewhat harder at times than other Zelda games, Link's Awakening was the first top-view Zelda game to feature jumping and platforming, and it made full use of them. It's also the first Zelda game to feature fishing, a favorite mini-game of the series and the first to allow players to assign different items to the buttons and actually opt not to use the sword. What makes the game truly remarkable is that it holds up to its 16-bit prequel, A Link to the Past, and even manages to surpass it in certain respects. While handheld spin-offs are generally considered the low point for game franchises, Link's Awakening proves that they can offer just as rich a gameplay experience. A glitch in the original version of the game allowed players to "warp" by walking off the screen. With some good timing and careful pressing of Select, players could walk Link off an edge, and into the next section of the map. This allowed players to skip ahead to certain parts of the game... or corrupt their save data.